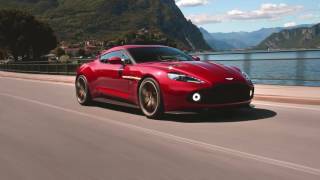 The world class brand Aston Martin and Italian design-house Zagato now is back with another model Aston Martin Vanquish Zagato Concept 2016. With this model the Aston Martin will complete its fourth year in sec-generation cars. The model is also the latest creation from their long-standing partnership. The Vanquish Zagato Concept is the fifth car to emerge from collaboration that stretches back over five decades, pairing Aston Martin’s acclaimed sporting, dynamic and material qualities with Zagato’s signature design language. 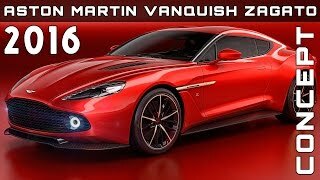 Let us have a close look at the reviews of the Aston Martin Vanquish Zagato Concept 2016 and get to know more about the stuffs it contains. The interior of Aston Martin Vanquish Zagato Concept 2016 is pretty much standard Vanquish as far as design goes. The cabin has enhanced by means of exclusive materials and features, which a regular Aston Martin does not have. Highlights include "Herringbone" carbon-fiber painted with anodized bronze detailing on the center stack, and aniline leather. The interior is also designed by the unique “Z” quilt pattern stitch on the seats and the door panels, "Z" embossed headrests and center console, and double contrast stitching on the upper door panels. The “Z” stitch is also done on the headliner, providing a stunning contrast with the black background. In all, the Aston Martin Vanquish Zagato Concept has a unique interior which will offer a amazing driving experience to its customers. 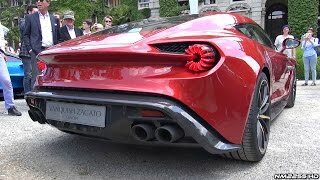 The exterior of Aston Martin Vanquish Zagato Concept is mind blowing and fascinating. The front fascia carries its clues from the regular Vanquish however the lower section has been changed dramatically. The traditional grille gets replaced by the massive piece featuring integrated LED fog lamps at each corner. Below, the grand tourer has an aggressive, vented splitter made from carbon fiber. The side look of the model is redesigned with feature like new body panels and sculpted side skirts, lower body section, and beltline. Moving towards the rear end you’ll notice the ‘double-bubble’ integration that we have seen in 1950s. The rear fascia gets more aggressive and sporty with its beefy stance, especially the wheel arches. In addition, there is the round taillight fitted with a blade LED lighting pattern similar to the track-only Vulcan supercar. It also sports a retractable spoiler and a hatch instead of the traditional trunk lid. 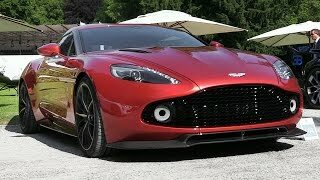 There’s a massive, trapezoidal grille that mimics the shape of the front element and a quad-exhaust pipe layout giving the Aston Martin Vanquish Zagato Concept aggressive stance. The Aston Martin Vanquish Zagato Concept is adorned with a 5.9-liter V-12, delivering total output of 568-592 hp and peak torque of 630 nm. 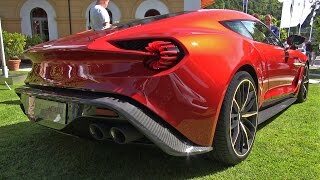 The performance figures of Aston Martin Vanquish Zagato Concept are still not shared however we expect to have them somewhere around the mid of year.